Kick Start the Summer with Plenty of Outdoor Fun Activities! Toronto events June 2013 features must see events, festivals, concerts, shows and fun-filled activities. Browse the listing below, see what's happening in Toronto in June 2013 and take your pick. It's early part of summer and it's time to move outdoors. The weather is not too hot yet - very pleasant and mild! Major outdoor June Toronto events include Taste of Little Italy, Toronto Pride Week & Pride Parade, Toronto International Dragon Boat Festival and Luminato. If you love music and melody, there are plenty of options to choose from. Waterfront Blues features best of the Canadian and international blues musicians, North By NorthEast (NXNE) offers live music shows and concerts and TD Toronto Jazz Festival mesmerise the visitors with performance from Jazz maestros. June is also great month for some exhilarating sports action. 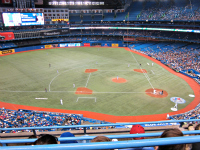 Root for Toronto Blue Jays at the Rogers Centre and if you like soccer, Toronto FC plays their home games at the BMO Field. Waterfront Blues, Toronto's authentic Blues festival, brings the best in Blues at Woodbine Park. You will be in for a treat with some melodious Blues presented by award winning Canadian Blues artists. Free admission! This year, the festival features multi Blues Music Award winner Deanna Bogart, multi Juno Award winner Fathead, Juno Award winner Morgan Davis and many other upcoming and talented gems of the Blues. Enjoy some mouth-watering food including award winning BBQ and kids can have some fun-filled activities at Children's Fun Zone. Overall, a great way to spend a whole day with family and friends. Toronto Tango Festival is a four day event celebrating the Argentine Tango. If you like to learn few steps of Argentine Tango dance, the festival offers ideal platform for you. You can register for different workshops, practicas and milongas conducted by qualified instructors. Or if Argentine Tango dance is difficult for you, just enjoy the breathtaking performances from Tango legends. No matter what, the biggest Argentine Tango event will surely intensify your fascination for this rich, appealing Tango dance. Woof woof woof... Sounds something familiar? Take your dog to Woofstock, the largest outdoor festival for and about dog in North America. It is a must-go event for dogs and the people who love dogs. Even if you don't have your dog, it's nice to see dogs of all breeds and sizes, many of them in fancy and quirky dress. Each year the festival offers something original, unusual and innovative. Enjoy Woofstock Fashion Show, Stupid Dog Trick Contest, Best Costume Contest, Ms. & Mr. Canine Canada Pageant, dog race and much more. Vendor booths offer everything that your dog loves  food, toys, latest fashion, gears and gadgets. Some booth owners also offer a lot of freebies, especially during the last few hours of the event. Every year in June, hundreds of performers assemble in Toronto for the annual musical extravaganza North by Northeast. If you are craving for hot and fresh music, the event is worth attending. Popularly known as NXNE, it is North's counterpart of South by Southeast (SXSE) festival held annually in Austin, Texas. For seven days (and night! 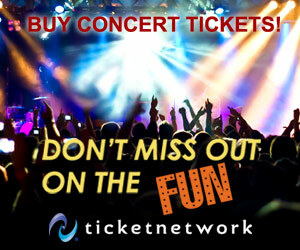 ), music takes over Toronto's downtown core with an impressive array of concerts and musical performances. The festival also offers you a great opportunity to explore and enjoy music-themed films, comedy shows, digital interactive media conference and visual art. Whether you like hip-hop and rock or folk and experimental country music, with 950+ bands playing at 50+ venues the festival offers something for every music buff! World's best wines, spirits and cool breeze - what a stunning combination! Toronto Wine & Spirit Festival is held at the Sugar Beach, on city's fantastic waterfront. Toronto's first outdoor wine festival offers you amazing opportunity to sample finest wine, spirit and craft beer with live music and a cool gentle wind. Enjoy the sounds of live music, sip some great wine and spirit and make new friends – a great way to welcome summer! Experience all things Italian at the annual Taste of Little Italy festival. The 3 days long street festival takes place on College Street between Bathurst and Shaw. The festival celebrates Italian culture with Italian food, music and arts. There are quite a few options to enjoy the event - savour real Italian cuisine from almost 50 participating restaurants and bars; relish authentic Italian wine and beer; explore several arts and crafts booths; enjoy live music and performances. If you crave mouth-watering barbecued delicacies, cold beer and live music under beautiful blue sky, the Beach BBQ & Brews Festival is a great family event for you. The annual event takes place on Father's Day weekend at Woodbine Park in the Beaches. The Ribfest offers great BBQ from Ribbers from across Canada, several BBQ competitions and grilling demonstrations. You will also find a large selection of beer and wine to sip, smell and slake your thirst. Kids can enjoy at the special Children's Area featuring variety of amusement rides and fun filled activities. 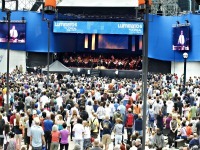 Luminato is one of the preeminent arts and culture festivals in North America and has become one of the staple events of Toronto in June. The annual ten-day festival showcases the authentic richness of the arts in Toronto, reflecting the multicultural, vibrant communities of the city. The festival celebrates arts in every possible form  theatre, opera, music, dance, film, magic, literature and visual arts. You can enjoy the performances, concerts, displays and lectures from renowned Canadian and International artists and writers at several indoor and outdoor venues. David Pecaut Square, the hub of the festival, features free daily concerts, great food and amazing festive atmosphere. For free events, admission is on a first-come, firstserved basis, so check the festival schedule and make sure to arrive early to get a seat. 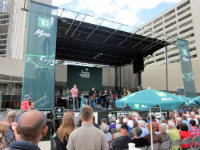 If you like the melodious tunes of Jazz, the TD Toronto Jazz Festival is an event not to be missed. The event has become a premier jazz festival with over 1500 artists performing 350+ concerts at approximately 40 locations in just 10 days. Every year the festival features several biggest names in jazz including some of the greatest jazz celebrities and Grammy winners. Whether you prefer traditional or fusion jazz, you will surely find performances that suit your interest at the TD Toronto Jazz Festival. What started as a one day festival, today Franco-Fête de Toronto has turned out to be a truly mega Francophone festival of Canada. Toronto's International Francophone Festival celebrates Francophone culture and heritage with French music, cuisine and arts. This year Toronto's largest Francophone music event has moved to bigger and better venue, the Yonge-Dundas Square. The festival offers live music concerts from headliner performers, authentic French food, dance and face painting for kids. The family-friendly festival has something for everyone. Come and enjoy the sounds and tunes of fascinating French music! Pride Week is an annual festival of arts and culture in Toronto. Celebrated during the last week of June, it's one of the largest Pride celebrations in the world with an estimated attendance of over 1.2 million people. Experience history, culture, creativity and diversity of Toronto's queer communities during the Pride Week which features 10 days of community activities, a street fair, live performances and outdoor entertainment, Family Pride, Dyke March and many other events. Unquestionably, the Toronto Pride Parade is the pinnacle of Pride Week. Each year the huge street parade thrills the world with artistic talent and energy of the queer community. The Pride Parade begins at the corner of Bloor and Church Street at 2pm on last Sunday of the Pride Week. Arrive early to avoid any disappointment! Have you ever experienced the thrill of boat racing? 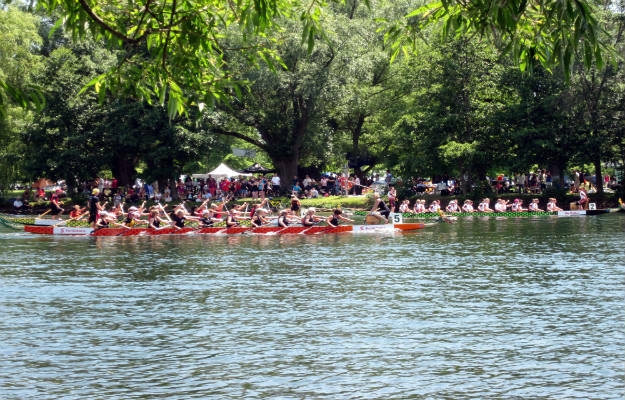 If not, the Toronto International Dragon Boat Race festival offers you an opportunity to enjoy one of the most exciting boat races in the world. The festival promises a fun-filled weekend that you will never forget. 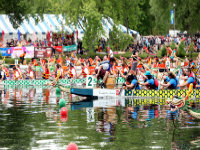 The two-day annual event celebrates the Chinese tradition of dragon boat racing. Attracting up to 200 teams and 5000 athletes from all around the world, it has become one of the leading Toronto events in summer. 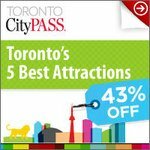 Toronto Ribfest is one of most popular Toronto June events, featuring amazing food, beverages, exciting midway rides, excellent music and live entertainment, lots of fun activities for kids and a breathtaking fireworks show on Canada Day. Relish the lip-smacking barbecued ribs from award-winning Ribbers, along with variety of other meat and vegetarian food selections from around the world. The Kidz Zone offers face painting, magic shows and more activities free of cost. The festival offers several midway type fun rides and attractions suitable for all every age group. The major attraction of the festival is fireworks spectacle on Canada Day. The Scotiabank CHIN International Picnic is the largest free picnic of its kind in the world, held annually at Exhibition Place. Come out for a unique picnic experience, but don't pack your lunch! The festival offers first-class live entertainment, family friendly activities and amazing variety of food and beverages. Enjoy performances from hundreds of singers, dancers and artists from around the world, explore petting zoo, have a fun with Family Circus shows, midway style amusement rides, Live Wrestling shows and bicycle races. The Shopping Bazaar offers something for everyone  jewellery, clothing, accessories, toys, chocolates, music, electronic and much more! Don't miss the Festival of Fire fireworks, Miss CHIN Bikini and Mr. CHIN Competitions  the three biggest crowd pullers of mega picnic event.